Let me start saying I love Fermin. I'm glad we're married, and that I have a partner in life. I love sharing a home with him. I know I am lucky. And having said all that: he is going out of town today on a business trip. It's his first trip in a couple of months. And I am so excited! Fermin used to go into the office each day, but didn't travel much. When he first took his current position, he was supposedly going to travel 50% of the time, and work from home the rest of the time. I remember feeling a bit sad and anxious that he might be gone so much that I would get lonely. He traveled more when he first took that job, a few years ago. But his trips were and are always short, and he's only away a night or two. He was rarely out of town two weeks in a row, back to back. It certainly wasn't too much. For the past year or so, his travel is even lighter. There will be stretches of a month or more that he doesn't travel at all. And he works from home pretty much every day, hardly ever going into the office that's about a half hour drive from our home. It's been a weird adjustment over time. I went from having all sorts of time at home alone, to now, barely any at all. Our house is small, and the walls are thin. I used to sing, write songs, and even occasionally record them when I knew there were no other humans in the house that might overhear me. But these days, I just can't do it without feeling like I'm being overheard. I know Fermin is busy, doesn't care about hearing me, etc. but still. It's stifling. 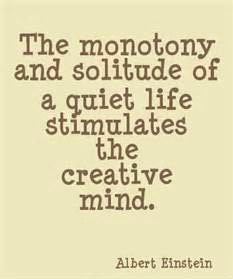 Creatively outside of solitude is hard. First world problems, I realize. But not having had much of a creative outlet lately has taken it's toll on me. I need to get a little bored and a little lonesome in my solitude. It's the best path I know to creativity. Thumbs up! Looking forward to seeing what's next. Why Must I Read This Kind of Crap? !